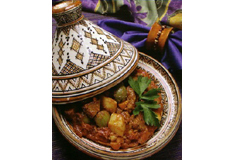 DESCRIPTION: Moroccan cuisine is a blend of African, Arabian and European influences that results in some of the most exotic food in the world. Few meals are more satisfying than a hearty tagine— the rich, fragrant Moroccan stew, served from its own elegant cooking vessel of the same name. Meat, poultry, fish and vegetables are simmered gently in the steam of the pot's conical lid, and the food, deliciously flavored with spices and fruit, remains tender and moist. Join us for an evening of aromatic spices, exquisite flavors, and wonderful recipes in this hands-on class that will definitely rock the Kasbah!